River Montessori Charter School is a vibrant, joyful, and diverse community of children, families, and staff dedicated to the child and Montessori methodology. We continually invite and welcome applications as we seek to enrich our community with enthusiastic and experienced Montessorians for all positions as we grow every year. Our public school is currently comprised of Transitional Kindergarten/Kindergarten, Lower Elementary and Upper Elementary environments. The school itself is nestled between two nature preserves in charming Petaluma, Shollenberger Park and Ellis Creek. We are located in the heart of Wine Country just 45 miles north of San Francisco, minutes from the Sonoma Coast, with easy accessibility to Lake Tahoe and the Sierras. We are a dynamic community of Montessorians who are eager to reflect on our practice and thoroughly enjoy our work with the children. Public Montessori offers a chance for many philosophical discussions, opportunities for growth, and thoughtful refinement and practice of our art-form. If this sounds like a match for you, we look forward to hearing from you and getting to know you better! 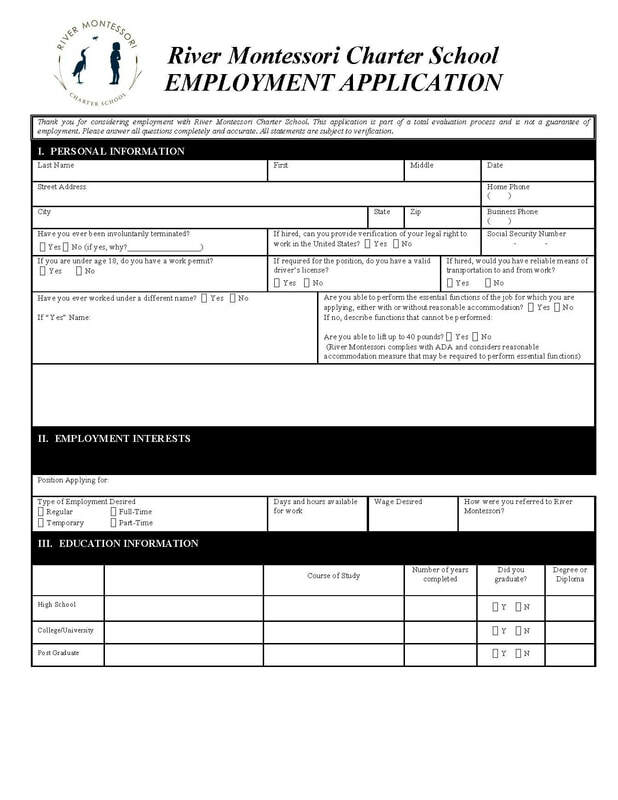 Click on link below to download an RMCS application for employment. Please select the specific position you are interested in for complete application requirements in order to be considered for employment. Complete applications should be submitted in person or via U.S. mail. Faxed and/or incomplete applications will not be considered.